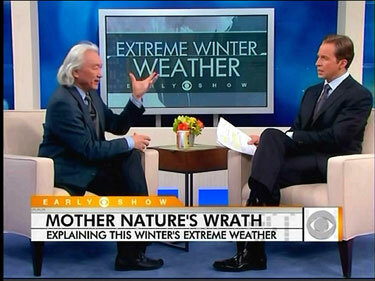 Speaking to physicist Michio Kaku on Wednesday's CBS Early Show, co-host Chris Wragge fretted over the recent series of severe winter storms and wondered: "...nine storms in seven weeks, why is this happening?...a lot of people want to talk about global warming and thinking that that may actually come into play here. Is that accurate? Is that having an effect on what's going on?" Dr. Kaku agreed with the suggestion: "Yes. It seems to violate common sense, but as the Earth begins to heat up, that means more moist air in the Caribbean and the Gulf of Mexico on average. Which creates more precipitation, and eventually more snow." Wragge followed up: "Is this going to continue?" Kaku argued: "...on average, temperatures are going to rise. Remember, last year was the hottest year ever recorded in the history of science, next to 2005, since 1880. So the Earth is heating up. We can debate exactly what's driving it. But, hey, get used to it. We're going to have more energy sloshing around the Earth, more extremes, and swings." Prior to discussing the supposed impact of global warming, Wragge briefly asked about other theories "behind this extreme weather." Kaku explained the idea of the weather simply being the result of natural climate cycles: "One theory says it's random, natural fluctuations in the weather. For example, we have something called El Nina in the Pacific around the equator, which is helping to divert cold air into the United States." The rest of the segment focused on the global warming theory. As Brad Wilmouth earlier reported on NewsBusters, ABC has also attempted to blame the harsh winter weather on global warming. On the January 21 World News, anchor Diane Sawyer declared: "...millions of people across the East saying enough already with the snow and ice and cold. Another winter storm roared through today. More records were toppled, and it heightened that question: Do the leading scientists now agree that this is global warming? And this is what winter will be from now on?" CHRIS WRAGGE: Here to explain why we're having such extreme weather is physics professor Michio Kaku of the City University of New York and author of the upcoming book, 'Physics of the Future' Doctor, good to have you with us. I think everyone wants to know, very simply, nine storms in seven weeks, why is this happening? Why is this happening? MICHIO KAKU: Well, snowstorms take place when dry, ice-cold weather from Canada and Alaska bump up into moist, warm air from the Gulf of Mexico. Monster storms like this are caused by fluctuations which draw more icy weather from the north and there's more moist air in the Gulf of Mexico because of increased temperature. WRAGGE: What are some of the theories behind this extreme weather, though? KAKU: One theory says it's random, natural fluctuations in the weather. For example, we have something called El Nina in the Pacific around the equator, which is helping to divert cold air into the United States. And also the North Atlantic oscillations, air currents in the North Atlantic, which again is helping to pull down, pull down more cold air into North America. WRAGGE: I think a lot of people want to talk about global warming and thinking that that may actually come into play here. Is that accurate? Is that having an effect on what's going on? KAKU: Yes. It seems to violate common sense, but as the Earth begins to heat up, that means more moist air in the Caribbean and the Gulf of Mexico on average. Which creates more precipitation, and eventually more snow. So global warming is caused when sunlight hits the Earth, and turns into infrared, red radiation, heat radiation shown here, and it's sort of like a roach motel, light checks in but the heat does not necessarily escape. WRAGGE: So I think the other big question people have, is this going to – I mean is this going to continue? Or is there a light at the end of the tunnel? KAKU: Global warming simply says more oscillations. So we have fluctuations, but on average, temperatures are going to rise. Remember, last year was the hottest year ever recorded in the history of science, next to 2005, since 1880. So the Earth is heating up. We can debate exactly what's driving it. But, hey, get used to it. We're going to have more energy sloshing around the Earth, more extremes, and swings. Flooding in one area and ice-cold temperatures in another. WRAGGE: Is this the same weather pattern, though, that's affecting us that's affecting other regions around the world? You've had problems in Brazil with mud slides, Australia's going through some weather issues now. Is this the same? KAKU: Similar. El Nina, cold weather around the equator, is contributing to what's happening in Australia. And I was in Brazil just two weeks ago, where they had monster mud slides, killed hundreds of people because of flooding. Massive flooding. And it's summertime now in Brazil. WRAGGE: In El Nina, what are the patterns here? Is it every couple of years? KAKU: Yeah, El Nina and the North Atlantic oscillations go back and forth every few years and they last a few months. And so we have both effects helping to bring down cold air from the north, while the Earth itself is heating up, creating more moisture in the Gulf of Mexico. And when the two meet, watch out. WRAGGE: Yeah, we were talking about it earlier. You know, it's a big Super Bowl weekend. In Dallas, they're having some weather issues. And people were saying, 'Wow, you know what, in three year's time, there's a Super Bowl that's going to take place outdoors here in New York,' with weather like this, it's going to be a tough, tough go. KAKU: That's right. It's going to be a flip of the coin. WRAGGE: Yeah, alright. Thank you very much. Good to see you this morning. — Kyle Drennen is a news analyst at the Media Research Center. You can follow him on Twitter here.